Whoopie pies seem to be all the rage right now, and even governments are arguing about them. They’re so popular that companies are coming out with a variety of pans specifically designed to bake these cake-like treats. The regular pans actually work very well, easily creating uniform cakes with minimal effort and ensuring that you get picture perfect whoopie pies. They also actually maximize yield, since you don’t end up with oddball shapes that won’t make a perfect pie (although you do miss out on having the “reject” pieces around for snacking!). Wilton wasn’t satisfied with regular pies and has come up with a Giant Whoopie Pie Pan. 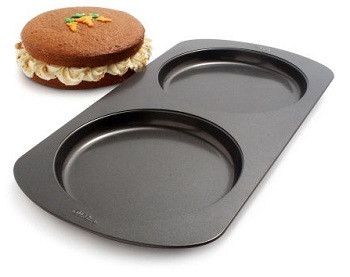 Like the Giant Cupcake Pan, this allows you to bake one jumbo treat where you would normally make many small goodies. 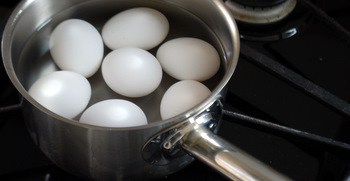 The nonstick pan has two 8-inch cavities and each holds about 4 cups of batter (8 cups total). The cavities will bake two relatively thin cake layers that you can sandwich together with a generous layer of frosting when they’re cool. The capacity is about the same as a 9-inch round cake pan, so you’ll be able to split regular cake batters into this pan to turn them into whoopie pies. You could, of course, just bake a regular cake, cut it in half and fill it whoopie-pie-style, but you won’t get the whoopie pies’ signature domed look by taking that shortcut. I’ll still probably take the shortcut if I want a huge whoopie pie, but I do think that this pan is great if you make a lot of whoopie pies and really want a “wow” factor with your baking. It is also perfect for making a giant birthday cake for the whoopie pie-lover in your life. Whoa. Now THAT is some whoopie pie! how is this different from using two regular round cake pans and not overfilling them, resulting in flattish round cakes? two 8″ cavities? this must be a monster size of a pan that probably wouldn’t fit in my oven..I think I’d just use two 8″ cake pans and divide the batter between them, I’d still get the dome on both halves that way too! This pan seems rather uninspired. It’s not in a novelty shape to justify its rather limited (and duplicate) function, and you can’t rotate each cake for even baking like you can with individual cake pans. It is not that easy to make a giant whoopie pie. If you use your regular whoopie recipe, the cake is too rich and cracks all over the top and it doesn’t look like a real whoopie pie. 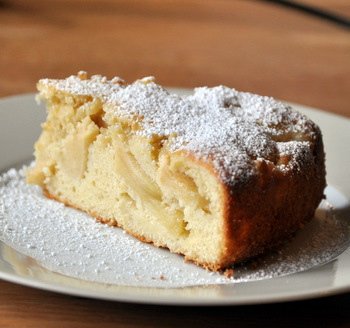 If you use a regular cake recipe, it’s not moist enough. I’m going to try this pan. I hope it comes with a recipe.